Pizza Hut Malta was recently entrusted by Endorphina Inc. with the task of delivering almost 600 pizzas to various locations around Malta. In fact, this was the single largest delivery order in 25 years of operation in Malta. The order was to deliver around 600 pizzas to nearly 200 different locations over lunchtime. To meet the high expectations of the customer and to deliver hot and fresh pizzas in such a short period of time, the operations of all five Pizza Hut restaurants were included. Endorphina Inc., a Czech online gambling company established in 2012, was celebrating obtaining its Malta Gaming Authority Licence and wanted to share this news with all operators within the local gaming industry. 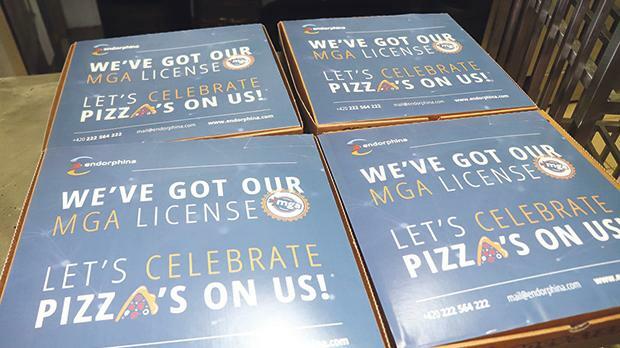 To convey this message, all the Pizza Hut boxes were co-branded for the occasion with Endorphina’s logo and a message saying: ‘We’ve got our MGA! Let’s Celebrate… Pizzas on us!’. Nathalie Xuereb Saydon, franchise manager of Pizza Hut Malta, said: “It was challenging to organise and ensure a smooth delivery of fresh, hot pizzas to all locations but definitely a very fun experience to have been a part of. It was an honour to collaborate with an external company in order to help them execute their plans and we are proud that Endorphina entrusted us with this project.” The lucky recipients of the pizzas were all very pleasantly surprised to be greeted at work with a pizza for lunch.